A modern retelling of Shakespeare’s “The Tempest”, “Miranda From Stormville” tells the story of nineteen-year-old Miranda living in Stormville, New Jersey with her sick father and his caretaker Ariel. After a mysterious storm, they are visited by two stranded travelers, Will and Steve who have found themselves stranded after crashing their car on a nearby highway. Outsiders to the mysterious Stormville and stuck waiting for their car to be repaired, Will and Steve discover that there may be more to this hidden New Jersey town and the people living there than they thought. 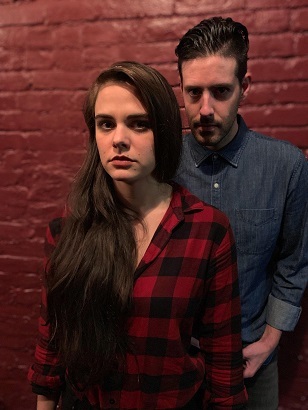 Mackenzie Menter as Miranda, Brendan Cataldo as Calvin. Photo by Random Access Theatre. Though a lovely story throughout, it did at times feel as though the language could not quite find what it wanted to be. It teetered between realistic human speech and the poetic Shakespearean verse that it was adapted from. This created a sort of dreamlike heightened speech that worked sometimes but often felt as if they play did not know what world it wanted to be in. This also meant that some of the more exposition heavy lines were not hidden behind poetry and could be spotted very quickly. That being said, “Stormville” still was full of good performances. Mackenzie Menter portrayed Miranda with a hopeful desperation that anyone who has been a teenager in a small town can relate to. Another standout was James A. Pierce III as Steve one of the travelers who arrives in Stormville. Pierce acts as the straight man through all of the confusion and often steals the show with his reactions to everyone around him. He was a great foil to Gabe Templin’s more “head in the clouds” Will. Pierce and Templin worked great as a duo, though Templin’s smiley “aw shucks”-ness did feel a little much at times. A shout out must also be given to set designer, Roni Sipp who created a beautiful set that brought me into the world of “Stormville” from the moment I walked in to the theatre. The umbrella and plants hanging from the ceiling brilliantly gave the feeling that we were really in the storm. The car set on the side of the theatre was simple and effective. All around a lovely set for a great show. “Miranda From Stormville” is a good adaptation with entertaining performances. Despite some of the language being confused I walked out having enjoyed a new take on a classic story. It featured: Anna Cain, Brendan Cataldo, James A. Pierce III, Mackenzie Menter, Gabe Templin, and Richard Wayne.